On Friday morning it came down to the last game of the season with Country Bowls Cubs holding onto 5th position by 1 point against the Roundheads, so everything was to play for. The Cubs welcomed San Luis Pumas and were motivated to score as many points as possible and they did not disappoint. With 4 out of 5 rinks winning and the overall shots were a positive difference to the cubs of 44, can they hold onto 5th place? The newly formed cubs have excelled in their first year at competitive bowling and deserve every success. Winning rinks were Sandra McIlroy, John Burke & John Mallet, Chris Stevens, Craig Dyson & Andrew Bryce, Dave Smith, Dot Davies & Niel West and finally Sheena Mallet, Derek Lewis and Peter Robins. 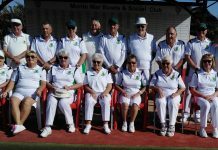 Country Bowls Geckos were away for their last match of the season in the afternoon against Quesada Swans. From the off the Geckos took command with a real determination to finish the season on a high with another good win. A couple of the rinks were very close at the halfway mark and in the second half one rink was nip and tuck to the very end. By the 18th end the Geckos had their wish and were well up on all but one rink which was 3 shots up going into the last end, but unfortunately managed to drop 4 shots losing them the game by one shot. Really bad luck to Sylvia Rennie, Jean Turner & Jim Rennie who have been so successful all season to lose by just one shot on the last end. Monday morning the Palominos entertained Greenlands Chestnuts and played well to take 3 rinks and the overall shots, with a wind that was tricky to say the least. A good result for the Palominos. The Raiders were at Vistabella playing the Buggies and met some strong opposition, though coming away without a point. Sometimes the opposition is just too strong. Meanwhile the Pintos were at Mazarron playing the Miners, the stiff breeze making playing a mat with a reduction from 8 rinks to 7, just a little difficult, never seems to work well to me. But as always the company was good and we enjoyed the day, though alas we came away with just one point. Friday found the Rangers playing host to La Marina Merlins, playing well and ending with 3 rinks and the overall shots by just the one, a good result showing that the extra moment of concentration can bring you the extra 2 points. Meanwhile the Mustangs were at Greenlands against the Oaks and put in a good effort and particularly perseverance in the case of John Skipper’s trip, getting used to the rink until 15-1 down, then coming back to win 17-16. The Mustangs came away with 2 rinks, a very good away result. We should at the end of the season thank the team captains for their sterling efforts. Sunday saw Irelands weekend of woe continue, after Wales beat them (sorry) the Emerald Isle beat Ireland in the annual St Patricks Days game at the Isle 95-93 to take back the trophy, well done to all that took part in the usual good spirit. In the discovery Division, the Maples were away to La Marina Pathfinders, quite a cold day with a stiff wind. A very close game played throughout meant it was down to the wire before you could call the game. Final score was, shots 78 – 74. Points, 8 – 4. Best winning rink was A Toozer, C Dewar, skip. R Lee. 19 – 14. With one match left to play, we cannot be caught so this result will ensure we go up next season, so congratulations are in order to all members of the team, well done. Meanwhile our other team the Sycamores, were at home to Monte MarToreadors. Final score was, shots 82 – 77. Points 7 – 5. Best winning rink was Z Wilcock, R Stansfield, skip T Hill. 25 – 6. 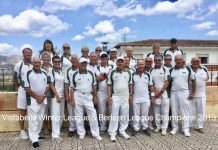 In the Winter league we travelled up to Benitachell Bowls Club, The weather was not on our side for most of the game but we soldiered on. Final score was shots 72 – 93. Points – 4 – 8. Best winning rink was B Tomlin, J Giddings, J Wilcock, skip B Collins. 16 – 15. In Division A the Maples were at home for their final match against El Rancho Mustangs. After a friendly but competitive game, the result was as follows.. Shots 93 – 64, Points, 8 – 4, best winning rink was A Toozer, L Rudge, skip C Dewar. 23 – 9. The Elms meanwhile were away to La Siesta Silvers, final score was Shots 80 – 69. Points 6 – 6. Best winning rink was D Watt, C Stobbart, skip G Watt. 25 – 11. 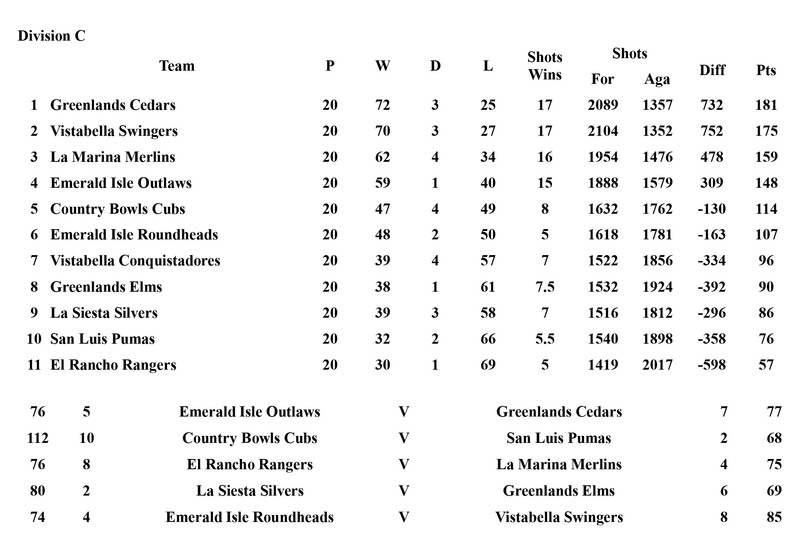 In Division C the Southern League, the Cedars were away to Emerald Isle Outlaws. final scores on the doors were – shots 77 – 76. Points 7 – 5. Best winning rink was L Morris, V Duchart, skip T Hill.20 – 11. This result ensures two of our teams have been promoted so well done to the Maples and Cedars. 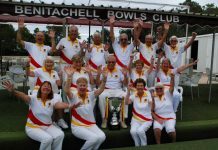 For all inquiries please contact Chris Dewar on 698418987 or visit our website at www.greenlands-bowls.wixsite.com/greenlandsbowlsclub. Monday 18- 03 – 19. The Pathfinders were at home to Greenland Maples. Points were 4 for and 8 against. Shots for 74 and against 78. The two winning rinks were Jean Tregoing, Garth Slater, John Withers 17 – 16; and Reg Jackson, Dave McGaw, Terry Perchard 15 – 12. All other rinks were very close but didn’t quite make it. The Explorers we’re away to San Luis Klingons. Points for 2 and against 10. Shots 62 for and 89 against. The only winning rink was Janet Parsons, Jean and Don Fowkes 18 – 11. Wednesday 20 – 03 – 19. The Winter league played Emerald Isle. The points were 2 for and 10 against.shots were 61 for and 99 against. The only winning rink was that of Janet Parsons, Jean Fowkes, Peter Parsons and Don Fowkes 24 – 9. Friday 22 – 03 – 19. The Ospreys we’re at home to La Siesta Blues. Points were 10 for and 2 against. Shots were 96 for and 66 against. The best winning rink was Janet Parsons, Jean and Don Fowkes 26 – 11. The Merlin’s were also at home, afternoon, to El Rancho Rangers. Points were for 4 and against 8. Shots were very close, 75 for and 76 against. Best winning rink was Jean Tregoing, Bernie Carr and John Morgan 22 – 10. 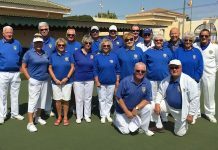 Last weekend we had two teams playing in Mojacar at the Indalo bowls club 4 day event 422 competition. The team of John and Lorita Rae and Mike and Carol Smith won the top prize. Well done to both teams. A good time had by all. 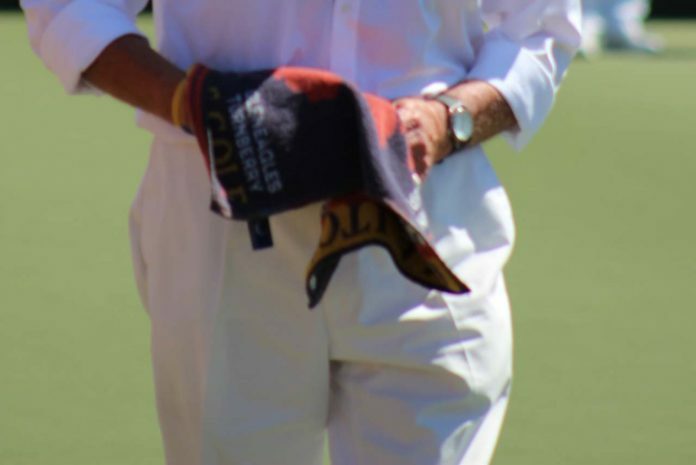 On Monday in the Voyager Division the Apolloss played against San Miguel Beagles in a match that finished up with both teams getting a 6-6 draw with the Apollos taking the shots by 79 to 67.Dawn and John Taylor with Brian Harman with a 34 shots to 5 win producing much to get this result. In the Voyager Division Sputniks had a bye this week whilst the Pioneers played San MiguelPointers and lost the match by 94 shots to 72 with the winning rink coming from Doug and Fay Beattie with Norman Adcroft with a 19 shots to 13 win. In the Winter League La Siesta took the trip to Javea with several of the regular squad unavailable and despite not winning any rinks and going down by 113 shots to 68 it gave the club the ability to blood some fresh faces in to the team. In Division A Blues finished their season away at QuesadaSwallowslosing the match by 91 shots to 94 winning on the rink of Dave Davies, Harold Charleton and Irene Mangan by 34 shots to 8 picking up 2 points leaving the Blues to finish 10th out of 12 teams in the Division. 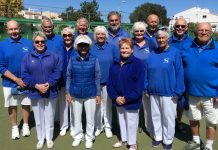 In Division B Golds at home to Quesada Swifts lost the shots by 77 to 83 but won on the rinks of Bill & Sue Jordan with Pat Moore 25-15, Doug Beattie with Fay Beattie and Ros Stockell 22-18 and Barbara Cooper with Vic Mahomet 18- 16 sharing the points 6 apiece to finish 5th in the table. Away at Greenlands on quite cold March morning the Toreadors had good result. Winning on two rinks and drawing on one. Well done to the winning rinks of Sheila Roberts, Diane Horsington skip Mick Soars. Shots Toreadors 77 – 82 Sycamores. Points Toreadors 5 – 7 Sycamores. A tough game against the Treckers the Matadors only managed to win on one rink. Well done to the winning rink of Harry Dobson, Ronnie Cairns skip Dave Melville 17 – 14. Shots Matadors 77 – 100 Trechers. Points Matadors 3 – 9 Treckers. Monte Mar played host to San Luis in the winter league today, weather could have been better and so could the bowls. We won on one rink and drew on another. Well done to Sheila Roberts, June Young, Pauline Woodfine skip Barrie Woodfine on a very good win 21 – 7 and Harry Dobson, Tanya Oliver, Rod Chamberlain skip Phil Goble drawing 13 – 13. then over to the Belfry for a lovely meal and a drink, great afternoon had by all. 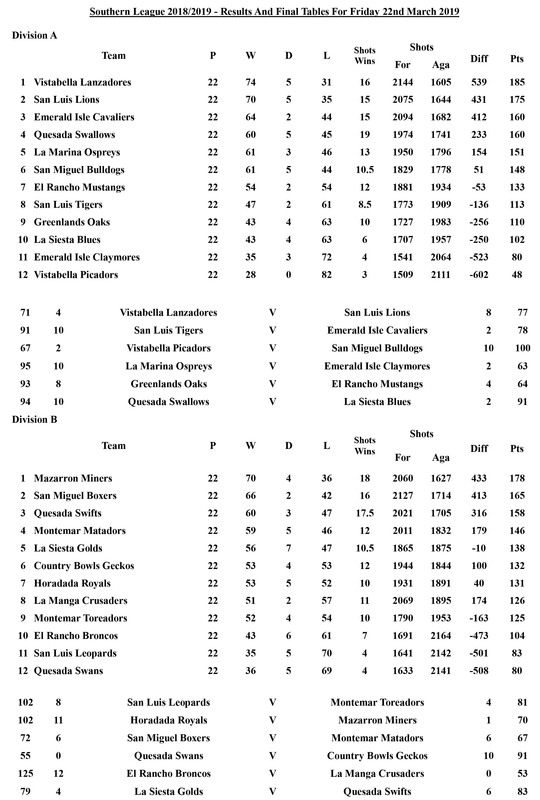 Shots Monte Mar 58 – 87 San Luis. Points Monte Mar 3 – 9. 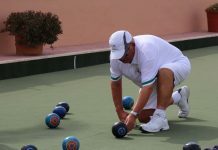 SAN LUIS BOWLS CLUB REPORT 22.03.19. SA League, Enterprise Division Monday 18th Klingons v LM Explorers, good result; 10pts-2, 89shots-62. Winners: Colin Jackson, June & Keith Jones 21-4, William Holtham, Sabrina & Russell Marks 20-14, Bob White, Janet & Peter McEneany 18-15, Giuseppe Galelli, Ann Holland, Ray Pollock 19-11. SL KLINGONS are A Division WINNERS. Trekkers, good result away v MM Matadors, shots100-77, 9pts-3. Winners: Allen Bowen, Marina Beardsall, Brian Pocock 24-17, Kevin McKenna, Bill Webb, Barry Edwards 16-16, Ros Holmes, Jan Pocock, Suzi Cooper 20-12, Judy Carroll, Jo & Jules Pering 26-15. Vulcans v CB Flamingos, 2-10, shots 60-81. Winners: Pat Tilley, Chris Jackson, Bob Bromley 15-10. Romulans v EI Saturns, 7 useful points-5, 85shots-69. Winners: Robert Hicks, Mary Fromson, Lyndon Johnson 21-13, Chris Phillips, Allan Lever, Ralph Jones 13-13, Chris Lythe, Pat Barnes, Tom Fromson 22-7. Tuesday 19th PREMIER 20 KNOCK OUT COMPETITION FINAL v Emerald Isle; an incredibly close match to the last shot. Home team winners: Colin Jackson 21-9, Jan & Brian Pocock 16-15, Ann Holland, Pam Lockett, Giuseppe Galelli, Scott Malden 20-10. Away team winners: June & Keith Jones 15-12, Kath Reid, Jo & Jules Pering 18-13. Overall: 10pts-6, 129 shots-128. Wednesday 20th Winter League: v Montemar, good result 9-3, 87shots-58. Winners: Pam Lockett, June Jones, Peter McEneany, Keith Jones 19-9, Kath Reid, Giuseppe Galelli, Neil Morrison, Ian Kenyon 31-4, Ann Holland, Ray Pollock, Jo & Jules Pering 13-13, Bill Webb, Keith Phillips, Ray Clarke, Scott Malden 17-11. Southern League: Friday 15th Lions v VB Lanzadores, 8-4, 77shots-71. Winners: Colin Jackson, June & Keith Jones 16-15, Kath Reid, Pam Lockett, Ian Kenyon 18-9, Margaret Morrison, Keith Phillips, Neil Morrison 17-15. Tigers great result v EI Cavaliers, 91shots-78, 10pts-2. Winners: Judy Carroll, Marina Beardsall, Barry Roseveare 21-17, Helen Hammond, Peter Fuller, Scott Malden 19-15, Allen Bowen, Mags Haines, Brian Pocock 18-17, Jan Pocock, Les Bedford, Suzi Cooper 17-10. Leopards v MM Toreadors, good result: 8pts-4, 102shots-81. Winners: Ray Watmough, Dave Tilley, Drew Russell 21-14, Dennis Jackson, Margaret Clarke, Sue Ross 24-9, Audrey Ford, Steve Rossiter, Bob Bromley 27-21. Pumas: v CB Cubs 2-10, 68shots-112. Winners: Robert Hicks, Mary Fromson, Lyndon Johnson 28-7. 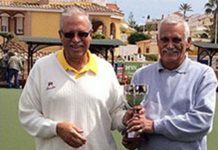 SLBC website: www.sanluisbowls.byethost7.com We welcome new & experienced bowlers, come along & see us, or contact June Jones, Club Captain: 691903773. San Miguel Dalmatians were away this week to Emerald Isle Moonraker, winning 10 – 2 (95 shots to 62), the best winning triple were Jack Jackson, Bob Graham and Bob Donnelly, 29 – 8. 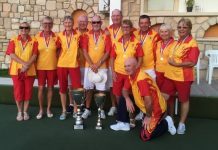 San Miguel Alsatians were also away to Emerald Isle Titans losing 4 – 8 (821 shots to 95), the best winning triples were Marilyn Shatwell, Gerald Shatwell and Mike Douglas 25 – 17. San Miguel Pointers were home to La Siesta Pioneers winning 10 – 2 (94 shots to 72), the best winning triple were Anne Young, Pat Staden and John Staden 24 – 20. 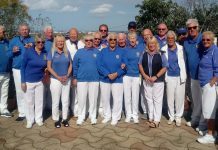 Finally San Miguel Beagles were home to La Siesta Apollos drawing 6 – 6, (67 shots to 78), there were two winning triples; Noel Davies, Gail Willshire and Fred Willshire 22 -10, also Don Whitney, Dave Johnson and Steve Cantley 26 – 14. On Friday San Miguel boxers were home to Montemar Matadors drawing 6 -6 (72 shots to 67) the best winning triple were Paul Cutting, Barry Jones and Bob Donnelly 24 – 5. San Miguel Bulldogs were away to Vistabella Picadors winning 10 – 2 (100 shots to 67) the best winning triple were Alan Booth Ken Hope and Mike Douglas 35 – 13. SAL LEAGUES. 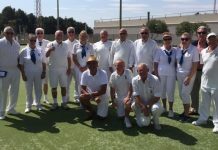 The penultimate week for everyone so how did they all fare, our Enterprise side the Albatrosses didn’t do too badly, away to the Quesada Diamonds, both sides won on two rinks and drew the other, the Diamonds won the long game…just. VB 83(5) – 85(7) Q. The Drivers were also away at Quesada against the Pearls, they too won on two rinks but lost on three. VB 71(4) – 86(8) Q. Discovery league Eagles took on another Quesada side ..the Rubies and beat them on all rinks..a great home win, just brilliant! VB 106(12) – 65(0) Q. The Voyager league Buggies, not only took all the points from their home game against El Rancho ..they have also won the division and with a game to spare, well done you beautiful Buggies…’that’s the way to do it!’ VB 132 (12) – 46(0) ER. WINTER LEAGUE. A trip to Bonalba this week, the weather caught us out but not the opposition, wins on four rinks another drawn and a good win for our Berleen team too. Shots VB 104(11) – 63(1) B. SOUTHERN LEAGUE Div A. The final week saw the Lanzadores at home to San Luis Lions, the Lions took wins on three rinks but the overall outcome couldn’t be changed, the Lanzadores have won the league and they go head to head with BBC at MonteMar on Monday 1st April for the North – South playoff…win or loose everyone in the squad are champions allready, a great performance everyone! The Picadors were home to the San Miguel Bulldogs winning on just the one rink. Shots, VB 67(2) – 100(10) SM. Div C Swingers away playing the Emerald Isle Roundheads finished their campaign with a win. Three winning rinks plus the long game. Second to the Greenlands Cedars in the division shows they have had a great season. Shots, VB 85(8) – 74(4) EI. Previous articleAnother week, another rescue!